American Kenny Roberts won the 1979 500cc World Road Racing Championship on the TZ500, so Yamaha Introduced the 1980 TZ500G as a "Kenny Roberts Works Replica", It was intended to be competition to the Suzuki RG500, a machine popular with non-factory sponsored riders. Under powered by 20 horsepower and ill handling, it was certainly no match for the RG, plus it was expensive at $14,000 dollars, especially when a TZ250 could be purchased for $4,100. Yamaha's smaller works four cylinder 2 stroke racer, the YZR500, or OW19, first saw competition in the 1973 French Grand Prix, won by the late, great, Jarno Saarinen. The bike had originally been little more than basically a "double" TZ250, including a rather large dose of the 250's peakiness, and had been fitted with reed valve induction to tame it's power delivery by the factory after the "Flying Finn", Saarinen, had made comment on the difficulty he had controlling this type of power surge from such a potent machine. 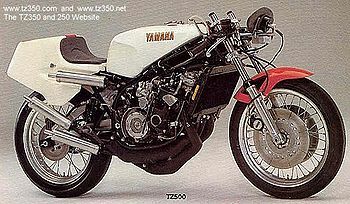 From it's initial successful debut the bike underwent regular changes with each new version, some changes were advantageous, and others not so, until the introduction of Yamaha's first production 500cc racer, the TZ500 G.
The "G" was a piston port four cylinder racer featuring mechanically operated powervalves to make it a little more "rider friendly". These operated by cable from the primary gears. Unlike the 750, this bike shared little in common motor-wise with the smaller twins, with it's entirely new crankcases featuring alternate ( individual ) cylinder barrel bolt pattern ensuring that no-one could "try out" a pair of 250 top ends as an experiment!! Internal gear ratios were able to be changed easily, with access to the "cassette" style gear arrangement being available behind the primary drive cover. The original spares kit had various different gears to choose from. Suspension wise, the forks came with air caps and the rear shock was adjustable for both compression and rebound damping as well as spring pre-load. Just two more models of TZ500's rolled off the assembly line following the "G", they were the "H" and "J". The J model featured new Nissin front brakes with new square shaped pads. Brake disc diameter went up to 320mm from the G and H's 300mm. 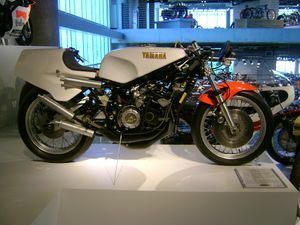 Neither the H or J was particularly competitive at World Championship level, so the factory ceased production of customer TZ500's in 1982, but has continued it's long line of works YZR500's right up to 2001 when development for the M1 MotoGP racer took over in preparation for it's debut season in 2002. This page was last edited on 21 January 2011, at 18:54.